Candidates who have Applied for IBPS RRB Clerk 2018 exam can download the IBPS RRB Clerk Admit Card from the official website and also from the following Page and also the candidate can get to know more about Application details, dates and so on. The IBPS RRB Clerk has released the Admit Card on the official website and candidate can log in to the official website using the credentials provided and can access the IBPS RRB Clerk Admit Card. And the candidates are advised to keep checking the Official IBPS RRB website for any notification and also to know more about the IBPS RRB Clerk. IBPS (Institute of Banking Personnel Selection). Number of Vacancies 5249 Jobs. Job Designation Name Clerk Posts. Initial Date to fill IBPS RRB Online Application Form 8th June 2018. Closing Date for IBPS RRB Apply Online 2nd July 2018. IBPS RRB Prelims Admit Card Issue Date Available Now. 19th, 25th August 2018 & 1st September 2018. Written Exam (Prelims & Mains), Personal Interview. The table above consists of the details about IBPS RRB Clerk Exam. The Candidates can go through the Important dates along with IBPS RRB Clerk Previous Papers. Also, the exam pattern helps the candidate to schedule their preparations for the exam. In this case candidates can make use of the IBPS RRB Clerk Previous Question Papers by solving all the papers below.Likewise, the candidate will get the general idea about the syllabus. Most Importantly, Applicants who have applied for IBPS RRB Clerk Exam are looking for IBPS RRB Clerk Previous Papers which are provided in the links provided below. As a Reference purpose, IBPS RRB Clerk Previous Papers, it helps the applicants to know more on the pattern and structure of IBPS RRB Clerk Exam 2018. Check Other Government Jobs Syllabus here. Candidates applying for IBPS RRB Clerk Admit card should carry any of the below documents which consists of the photograph which is similar to the photograph as in Admit Card. 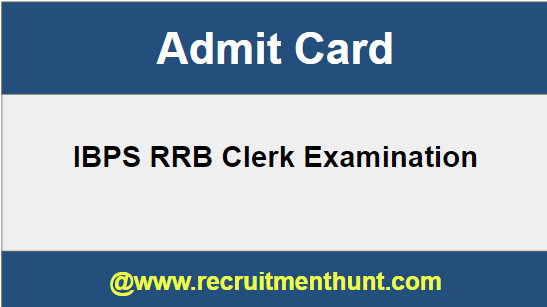 Look for the IBPS RRB Clerk Admit Card tab. Click on the IBPS RRB Clerk 2018 Admit Card Download link. IBPS RRB Clerk 2018 Admit Card will be displayed on the screen. Download and save the IBPS RRB Clerk 2018 Admit Card. Take a print out of the 2018 Admit Card. Submit the IBPS RRB Clerk 2018 Admit Card at the examination centre with any identity Proof. Finally Candidates can download IBPS RRB Clerk Admit Card & Exam Pattern here. So, Applicants can make their preparation easier by following Syllabus. Download Exam Patterns along with IBPS RRB Clerk Previous Papers 2018-19on this article. Also, For more Job Updates stay Tuned to our site Recruitment Hunt. Also, for more sarkari naukri updates, please visit Recruitment Hunt.